They are with Jesus, experiencing things we can only begin to imagine.We miss them so very much and love them beyond measure. And in all this, God is still good. We’re Sam and Rachel George. Mama and Daddy to sweet Clive Samuel and Winnie Joy who are now with Jesus. 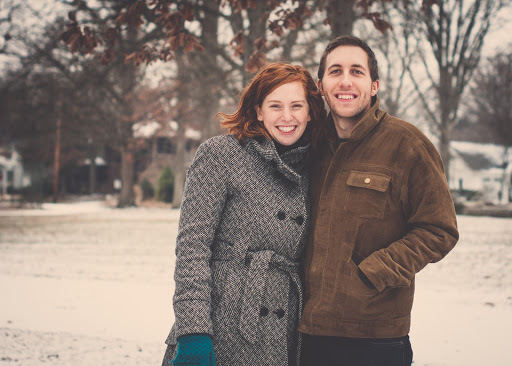 This blog shares our story and God’s story in our lives. We met in college and we’ve been married since 2009. We live in central Illinois in this sweet little-ish town called Danville. Rachel works part-time with kiddos with special needs. We love coffee and Danville, so we opened Mad Goat Coffee. It is an adventure. We love kids. We can’t wait to have our house full of them. After trying to get pregnant for nearly a year, we were so thrilled to be expecting baby George #1. Our hearts broke when we lost that baby in a miscarriage. It all came at a time of life that was in upheaval. We were starting a coffee shop and had multiple jobs. We didn’t have time to slow down and process our loss, and things became very difficult and ugly for Rachel as she tried to grieve in isolation. This experience (and eventually sharing about our miscarriage as our first blog post) helped us understand how much we need to grieve with people and not try to hide our deep hurts. Later that year, we became pregnant again with our son Clive. We got through the 12 week ultrasound and felt such a huge relief. We found out he was a boy and bought him the cutest little suit with a pink shirt. We went to an amazing natural childbirth class. We made him a video sharing how excited we were to meet him. Everything went so well until a routine 30 week appointment. Clive’s heartbeat was irregular and Rachel was immediately admitted into the hospital. He had an arrhythmia and rapid heart rate (SVTs). After close monitoring for 2 1/2 weeks, the doctors decided that the fluid was building up too much on his body and he needed to be born for treatments to start. 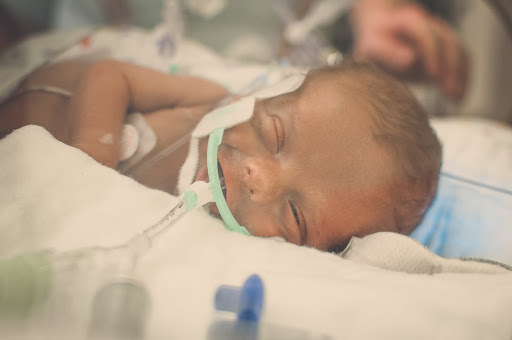 Baby Clive was born at 32 weeks on April 29, 2015. 4 lbs, 14 oz. Beautiful and wide eyed. He made great progress with all the preemie stuff. 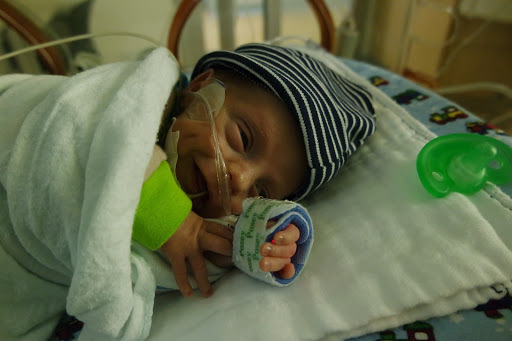 He was strong and happy and gave us great big grins as we stayed by his bedside in the NICU. The doctors tried medication after medication to treat his heart. A generally simple and treatable heart condition became a challenge as Clive didn’t respond to the medications. It still baffles us and his medical team. At nearly 1 month old, he went into heart failure and had an emergency surgery. He lived, but they were unable to fully correct his heart condition. He remained on life support for 10 days. We had to watch our sweet boy suffer unthinkable things. His vital organs were never able to fully recover from the period of cardiac arrest he experienced and he made it clear it was time to be with Jesus. After 39 days with us, Clive Samuel died in our arms on June 6, 2015. We sang to him and ushered him into heaven. He needed peace. His body was so broken. “It is with great sorrow that we had only five weeks with Clive. However, in that short time he blessed so many people. We are so blessed to have known him and call him our son. Even at eight weeks premature, he had a full head of beautiful auburn hair and an infectious smile complete with dimples. Clive showed a peaceful, content and joyful personality in the midst of sickness and difficulty. To those who were blessed to meet him and care for him, his life and personality loom much larger than the short time he had on this earth. We spent countless hours by his side reading to him, singing, rocking him, holding his hand and rubbing his beautiful head. He was never alone, always loved and received wonderful care from the hospital staff. Although he never left the hospital, he went to a better home than any we could have prepared for him. Clive still lives, and lives a life much greater than any of us yet know. He is filled with joy and peace; his body is now completely healed, and someday we will see him again. Clive wins. He’s in the arms of our Savior. He’s safe and healed and fully alive. As we continued to grieve the death of our precious son, we drew so near to God. He became our comfort, our strength, and our joy. We saw (immediately) how God was using our son’s life to change us and change so many others. It almost felt like it made sense, like we were given a glimpse into the bigger Story. Our sorrow was so great, but it was mixed with joy and remembering. Rachel got involved in groups with other grieving moms and found so much comfort and community there. Writing our blog helped us share our thoughts with family and friends, and countless people shared how much they learned from our openness. About 6 months after Clive died, we became pregnant with Winnie Joy. Rachel’s pregnancy was considered high risk, and we had numerous tests and scans to assure us that everything was progressing normally. We named her. We dug up the outfit that we’d bought in case Clive was a girl (forgot to return it!). It was a navy and white striped dress with a little yellow ribbon. Winnie’s pregnancy was full of bonding. She was Rachel’s little side-kick for gardening and exercising. Rachel stopped her full-time teaching job to reduce stress, as returning to work was extremely hard after Clive’s death. Everything looked routine in Winnie’s pregnancy until the 30th week. The doctor’s started noticing some fluid in her brain. As we continued to track it, they warned us that she could potentially have special needs, but these things can sometimes resolve by birth. We actually smiled and said that was fine. Adopting a kid with special needs has always been in the back of our minds, and maybe God was going to let us deliver one. Winnie’s size was another concern, but not an alarming one. She was delivered full-term and weighed just under 5 lbs. We felt sure that she was our little miracle baby (and in many ways she was). We felt assured again and again (even from God) that she was going to be okay. Rachel was able to have a VBAC, which was a huge blessing after a c-section with Clive. We didn’t even expect a NICU stay, although that was a bit naive considering her small size. 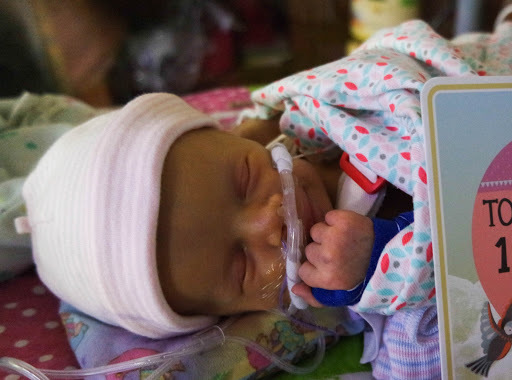 As we met with Winnie’s NICU doctors, a geneticist, and her neurologist, they shared that there was potential for long-term developmental delays but no immediate concerns. We loved her immediately. Our sweet little girl that needed so much from us, and we couldn’t wait to give it to her. A scan was done of her heart, and we were told she had no heart problems. We worked on oxygen and feedings for a week. In the early morning hours of her ninth day with us, we were urgently called over to the hospital. 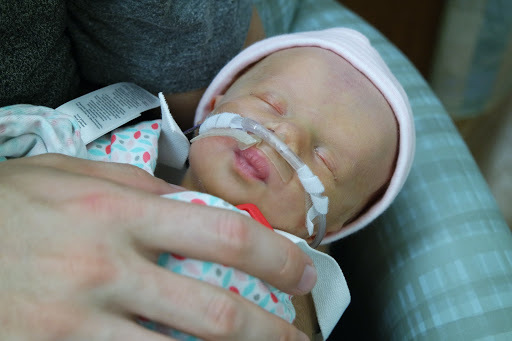 Winnie’s heart had gone through a normal newborn transition in which the ductus closed, but in this transition the blood needed to flow through a portion of her heart that was extremely narrowed and blocked (coarctation of the aorta). Winnie’s heart was unable to pump. We walked into the NICU and saw our tiny girl surrounded by adults. Compressions, emergency medicine. Nothing could help. She died on the table. Clive and Winnie’s deaths were so different for us. Clive’s felt like mercy at the end of his incredibly challenging heart problems and pain that he endured. Sweet Winnie felt like she was ripped away from our arms with no warning and no understanding. Our processing of their deaths has been very different, too. Winnie’s death has rocked our faith to it’s very core. It’s shattered us, and reshaped us, and we’re still figuring it all out. Clive’s death brought about this blog, Winnie’s death made us want to hide. Clive was buried in that little suit with a pink shirt. Winnie was buried in that navy dress with the little yellow ribbon. Even with intensive genetic testing, doctors continue to see no connection in their deaths. We don’t understand, and we suspect we never will in this life. But we get glimpses of understanding. In the moments when a friend shares about their life crumbling around them and needs me to walk with them, I see a glimpse of why I have been a student of suffering. A few months after Winnie died, we started the domestic adoption process. About 9 months later, we brought Coralie home. The adoption wasn’t without it’s share of complications, but we’re happy to have a positive relationship with Corrie’s birthmother. Corrie is a joy and a great blessing. She will always know of her sweet sister Winnie and brother Clive. And here we are. Still struggling, still living. We have good days and hard days. We have weeks where our parenting and our marriage are really negatively effected by our pain and grief. And then we have moments when we are able to help others. We’re in the middle, we’re learning, we’re processing. We’re digging in. We’re praying, we’re reading. Even when we don’t feel like it. We are the mom and dad to three beautiful children, and we are blessed. God is still good. Even in the valley, He is faithful and good. We know that truth. We hope you can see our honesty and struggles and God’s goodness in spite of our inadequacies.